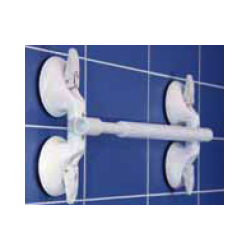 Handi-Grip portable grab bar consists of four suction cups with release levers and a grab bar. The suction housing and bar are high tensile plastic components, suction pads are natural rubber and all metal parts are stainless steel. Parts are easily disassembled, lightweight and take little space for travelers.